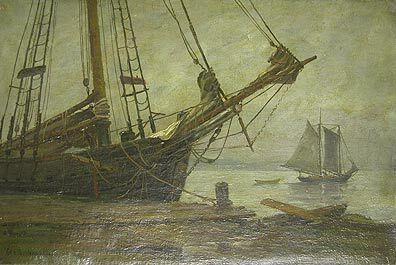 George Wasson, from a Brooksville family of shipbuilders and seafarers, painted and wrote about coastal Maine and the Penobscot Bay in the last decades of the 19th century and the early 20th. The Museum owns his last boat,Wave Crest, built in Brewer in 1916. This painting's donor's father, Percival Cushman, worked on Wave Crest with Wasson and cruised with him. When Wasson died Cushman inherited the boat and sailed out of Sorrento until boat was given to Frank Hatch who gave it to the Museum. Written on reverse in Wasson's hand, "Schooner Elizabeth of Brooksville, Maine, was built about 1815. She was owned by the Wasson family for 67 years."